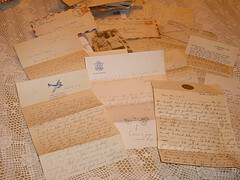 World War II Letters: Happy Expectations! Dad relates in this letter his excitement over the coming of his first child (me). Can you imagine my deep feeling as I held this letter and others to read about my approaching entrance into this world? Dad was far from Mom at this point and was worried about her, which is why he depended upon his parents to watch over Bonnie until he was able to get home. 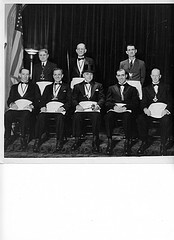 The other issue for Dad at that time was that my grandfather, who held the highest office in his Masonic Lodge, wanted both his twin boys, Elwood and Eddie to become Masons as well. From all I can gather, neither Dad nor Eddie was especially enthralled with the idea, except to please their father, but Grandpa B was very authoritarian and was one of those dads who felt entitled to decide everything from careers to whom his sons would marry. I believe that both Eddie and my dad became experts at appeasing their father, sometimes through delays and distraction before going their own ways. As far as I know, neither brother ever became a Mason. How Grandpa B felt about this, I don’t know. He always appeared to me as a very imperious man, and that demeanor was captured well in the Masonic picture in which he was wearing his tall silk hat. Please forgive me for not writing. I wanted to wait until I could tell you about Bonnie and I being able to see our “little world of happiness” ahead. I called her last night, and she said she had told you she is going to have a baby! I knew she wanted to tell you first, so I waited. Isn’t it wonderful? I’m the happiest, luckiest guy in the world. I only wish I could be there with her. This war is keeping us all from so much happiness. Dad, as much as it hurts, I guess I’ll have to wait to try to get into the Masonic Order until after I get back. I know Bonnie will need all the money she will get from me. It may be better that way, because when I come back and try for membership, if I get in, you can give me my degrees. I know how you’ll feel when you read this, but honest, I don’t know what to do. As far as I can see, I’ll have to wait. I was so very happy when I called Bonnie, and she gave me the news. Dad, if I can’t be there when the baby is born, will you and Mom go with Bonnie? She thinks the world of you and Mom, and if I’m not able to be there, I know it will help if you can be there instead. The way things look now, I won’t be there. I won’t be able to be there with her to buy the baby clothes and won’t be able to be with her when she needs me most, just because of this damned army. God, how I wish this war would end! Well, I guess I’ve said enough about my own troubles. How are you feeling, Dad? Bonnie said you were having your lower teeth extracted. I hope you’ll feel better then. I want to write to Bonnie again, and I’ll write you more often now. Bye for now. Be careful Dad. I’m sorry I’ll have to wait to get into the Masons. Write soon.